Of course, this was an oversimplification of the international standard for quality management released in 1987 and initially updated in 1994. In fact, this was not the intention at all. 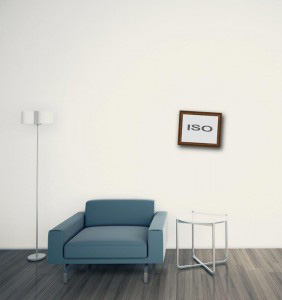 But those who braved the first editions of the standard mostly had documents to show for their efforts, including one that hung in their lobby – their ISO certificate. But, all that changed in 2000 when the ISO 9001 standard was rewritten from scratch. Instead of emphasizing documents, the new focus was on processes. The phrase “process approach” was introduced to put the spotlight on how work is done in a company, rather than what’s written about how work is done. The written word (documents), was recast in a supporting role with the new star being process. In ISO 9001:2000 and again in ISO 9001:2008 (the current version), we were to work on our processes and make them better (continual improvement) so results would improve and customer satisfaction would soar. Or so was the theory. To many, ISO continues to appear to be form over substance, whether working on your documents or working on your processes. The fact that certification is seen as the goal distracts from hitting the sweet spot of any quality improvement program – better quality performance that your customers recognize and appreciate (and pay good money for!). In this day and age where the best “value” rules the buying decision (not just lowest price), where is the “value” in documents, processes or a certificate? In and of themselves, these mean very little in the competitive world of a global economy. Customers aren’t looking for a certificate (though they sure ask for it), they’re really looking for what that certificate should represent… trust. Customers really want fewer headaches and disruptions, greater reliability and (yes) more for their money. A framed plaque in your lobby doesn’t guarantee any of that, really. So, what’s the big deal about getting ISO certified? You work hard, you put your best foot forward for an auditor and you pass the test. So what? 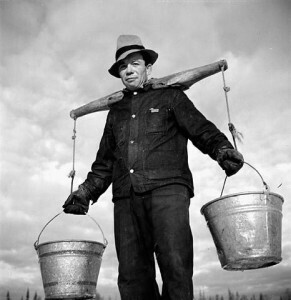 Recently, I’ve been telling our customers that getting ISO 9001:2008 certified does nothing more than give you license to carry a couple of buckets (empty buckets, mind you). After all of the effort to become officially ISO certified, you get two empty buckets you can do something with. What are buckets good for? Well, holding something of value of course. For me, that something is gold. For the sake of this analogy, let’s call one bucket the internal value of ISO. Let’s call the other, the external value of ISO. Before you have an ISO 9001 quality management system in place, it’s hard to hang on to improvements you make. It’s hard because things tend to go back to the way they were if you’re not watching. Let’s say you have some quality problem that has affected your most important customer. What do you do? Fix it, of course. Change the process! Update the procedures! Retrain the employees! Improve the supervision! And, for a while it works. But, let a few months pass and if you’re not looking, the problem returns. Because, as we said, things naturally tend to go backward. With our gold analogy, it’s as if you’re trying to hold the improvement in your bare hands and there’s only so much you can hold at one time. Things slip through your fingers, especially when you get busy or focused on other things. Every owner and manager in every small business has faced this and it’s frustrating. It can even lead to losing a customer who loses their confidence in your company, loses trust. 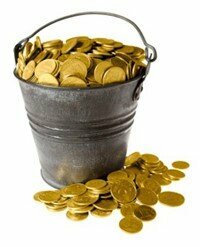 But, with a good, solid bucket, you can hold more gold and avoid it slipping through. The internal bucket holds the internal improvements you’ve made. The sides and base of the bucket represent your quality management system. What your ISO QMS is supposed to do is give you a structure for improvement. The fact that the QMS is a management system means top management keeps their eye on the ball. Through controls such as quality objectives, corrective and preventive actions, document control, internal audits and management review (among others) your ISO QMS helps you sustain improvements you’ve made and not lose them. The more you use these controls the stronger they get and the more they can hold. But, here’s the rub with the ISO certification. The ISO auditor essentially inspects the bucket to make sure it’s still in good shape. Every year, he/she will be back to be sure your bucket is still in place and it’s able to hold something. Then, he’ll/she’ll extend your license to carry the bucket for another year. 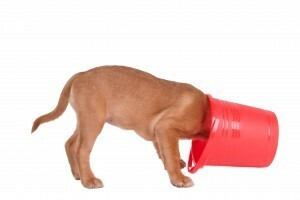 But, the auditor doesn’t really care what’s in the bucket, as long as it’s not completely empty! I should say that another way. The ISO 9001 standard, to which you are certified, is a quality management system that you can do something with. Having a QMS isn’t the point. Doing something useful with it (like carrying gold) is up to you. How much improvement you make (gold you collect) and how fast you make it is, again, up to you. The auditor won’t care (actually it’s just that the scope of the audit doesn’t apply to the velocity or volume of improvement, just that some improvement can be demonstrated). As you begin to see meaningful and measurable improvements fill your internal bucket, you can turn your attention to the external bucket representing value for your customers. The products and services you sell get you a chance with your customers. Performance sets you apart. Actually, it really takes outperforming your competitors on a consistent basis to build trust nowadays… and keep it. Your competitors are just as hungry to take your business as you are to keep it. Technology advances and global competition mean moving ahead, and staying ahead, is never ending. Does that sound like continual improvement? 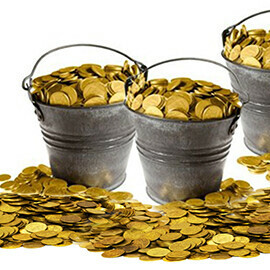 Gold that fills the external bucket is the value your customers receive from doing business with you. In each market, and with each customer, value can mean something different. Increasing the value you deliver to your customers can make the difference. So what does this have to do with ISO 9001? What ISO certification is supposed to mean is that you have a dedication to continual improvement inside your business so you can perform better for your customers. As you fill your internal bucket with gold, you’ll have credibility to show your customers why they should trust you, now and in the future. Through actual improvements in results, not just with a piece of paper hanging in your lobby, your ISO 9001 certification can be seen as making a huge difference in your ability to be a superior supplier for your customers. 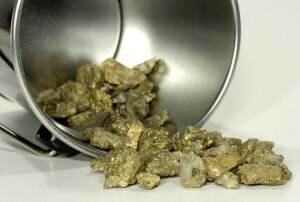 Filling the external bucket with gold requires that you show your customers the direct link between internal improvement and external performance. If you can back up your swagger just watch the gold fill your bucket. You’ll probably need a bigger bucket as time goes on. Wouldn’t that be nice?